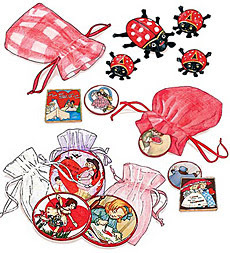 shaped fairy chimes and ladybug chocolates from Magic Cabin. I had hoped the chocolate ladybugs were the organic ones made by Rapunzel; however, it appears they are not organic but made in Germany of all natural ingredients. 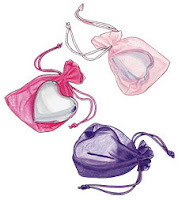 The heart shaped fairy chimes are also available from Hearthsong, Magic Cabin’s sister store. When I ask my daughter what her favorite holiday is,she answers Valentine’s Day. She says it is all about showing people you love them. When the box from Magic Cabin arrived, she asked me what it was in the box. I told her it was for Valentine’s Day. She told me that you aren’t suppose to buy presents for Valentine’s Day but show people you love them. I guess I fell into that consumerism attitude that you show your love by buying gifts. Leave it to a five year old to remind me there are better ways to show love than giving gifts! The Organic Consumers Association has some other great Valentine’s Day ideas. « Is Breastfeeding to Blame? That is so sweet (pun intended). Thanks for sharing your idea.